What type of countertop is this? what material and color? The model number you provided is more of a 2x4" tile. The image you have here looks more like 1x6 with mixed sizes. Are you sure this is the model number? Beautiful kitchen! Model #: 76-262, Item #: 525994 available at Lowe's. Nice kitchen, what is the name of the hardware pulls? Which brand if y - Nice kitchen, what is the name of the hardware pulls? Which brand if you don't mind. Thx! Thank you for your question. This is Stone painted finish on the Mission door-style. Dimensions - Can you share the width of the bar area? Thank you for your question. The cabinets are Painted-Stone finish. Kitchen cabinets - Very beautiful cabinets color. Could you please let me know the exact name of this color and where I can purchase it? What color in Sherwin Williams or Ben Moore would this gray be called? Wall Covering - What is the wall covering in the room to the left? Great color scheme! Oh great! Thank you for the info! Thank you Shenandoah for monitoring and engaging by answering questions. Too many times people ignore the interest. Says a lot for how you would interact with clients. Custom shelf? - Just curious if this was built or off the shelf! Thank you for your question. The trim paint is Valspar #770E-3 Pewter Mug Semi-Gloss Enamel Paint available from your local Lowe's store. Thank you for your question. The door style is Mission and the finish is Painted Stone. This unit is a combination of cabinet and accessories from Shenandoah Cabinetry available at your local Lowe's store. An in-store designer will be able to assist you. Looks really nice very clean and elegant! Cabinets - Do you have a full picture of these kitchen cabinets? Thank you for your question. Attached is an overall shot of this kitchen. How long is the wall cabinets? My wall is 11ft long and I want the same setup but don't know if all that will fit on it. Hardware - Where did you find the cabinet hardware? What is its name? I LOVE these but have not been able to find anything remotely close. Thank you for your question. The cabinet pulls are - Flat Contour Pull #3230SN Satin Nickel and can be purchased as special order at your local Lowe's store from Shenandoah Cabinetry. About how much were they? If you don't mind me asking I'm looking into the same ones. Full Overlay or Euro Style - Are these cabinets made full overlay or Euro Style (Full access)? Thank you for your question. These cabinets are Framed with Full Overlay Doors/Full access, not the European Frameless with Full Overlay/Full Access. Thank you for your question. The cabinets shown are the Mission door style in a Painted Stone finish. The wall color is Valspar Ash White W-F-520. What is the color of the cabinetry? Thank you for your question. This painted finish is Stone. Counter tops - What model/maker is the counter top? Where can I find it? Color: LYRA, available at your local Lowes Store. 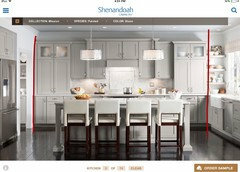 Counters and Lights - Can you please share the details on the countertops and the drum shade lights over the island? Thank you for your question. The countertop is Silestone NEBULA SERIES Color: LYRA, and the lights are Portfolio Chrome Pendant Light #17946-000; contact your local Lowes Store for availability. Backsplash - Beautiful! What is the backsplash manufacturer / name, please? Liner = Venatino 20-600 & Chair Rail =Anatolio Tile Venatino 20-601. I'm looking for information on the size of the rail on the shaker cabi - Any idea if this is a 2 or a 3 inch rail? Thank you for your question. This is the Mission door style and has 3" rails and stiles. Love the cabinets! - Is there a mechanism in the cabinet door so when it is opened it will not hit the wall next to it? Thank you for your question. There is a hinge restrictor that can be installed to allow doors to open to 90 degrees. Hinge restrictors can be special ordered from your local Lowe's kitchen designer. Beautiful - What is the floor? Is that slate? love this! - could you please tell me the wall color? Thank you for the question. The wall color is Valspar Ash White W-F-520 available at your local Lowe's store. What is teh colour of the cabinets? Thank you for your question. This painted finish is Stone on the Mission door-style, available at Lowe's. 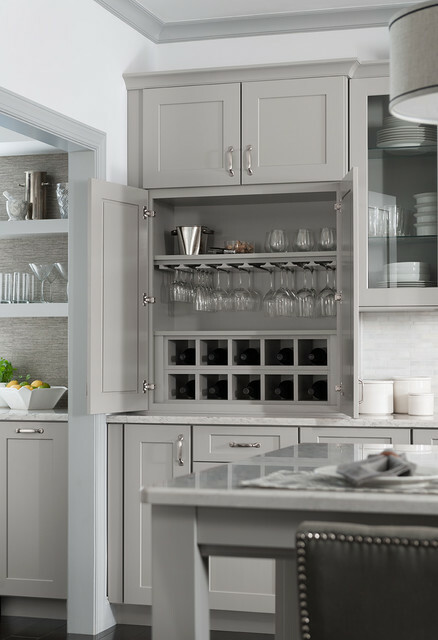 Creative kitchen storage ideas from Shenandoah Cabinetry. Option 3: Vertical extending into rail. Here, the pulls extend into the bottom rail of the wall cabinets and top rail of the base cabinets. This makes for a convenient location to reach, especially for wall cabinets that are a bit higher.